At school each term when I got my new exercise books the first thing I'd do when I got home from school was cover them in sticky back plastic so they didn't get all dog-eared through the term. Even back them I apparently had a dislike for things looking scruffy and too well used. I might not be at school any more but I do like pretty notebooks (what blogger doesn't!). This is a very cheap project to do and also pretty easy. You need to get your hands on some notebooks and it doesn't really matter how cheap and plain they are as you'll be covering them in something pretty. I picked up a pack of three exercise books from Wilkos for 99p but if you don't have a Wilkos close by you could try places like pound shops and discount book stores. This won't work with ring bound notebooks but will work with exercise books or notebooks with a thicker more book like spine. As for what you cover them with you can use whatever you want really but I used wallpaper samples, which are completely free. Just head to your nearest DIY store, have a browse of the wallpaper section and pick out some designs you like and grab a sample of each one. As you can probably see my 'wooden floor' background is actually wallpaper! As I bought a whole roll of it (it was pretty cheap OK!) 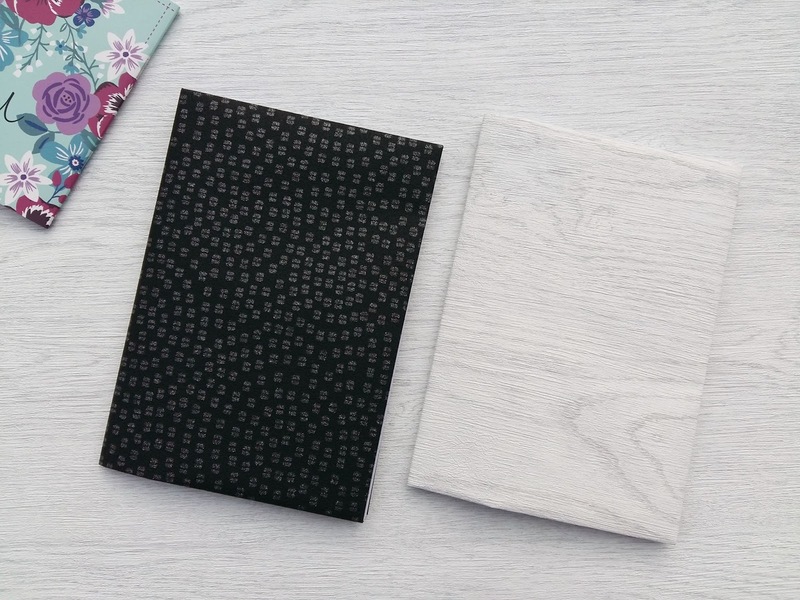 I thought I'd make a 'wood effect' notebook and then I grabbed a sample of a pretty black wallpaper. You can't see in the pictures but the little squares contain glitter so it sparkles in the light. 1. Start by cutting a section from your sample that is about an inch wider than your notebook all the way around. You'll need to open up your book or at least just flip it from one side over to the other to make sure the section is the correct size. 2. Open the book up and hold it in place flat while you draw around the outside with a pencil. You'll also need to make a mark on the top and bottom line where the fold of the exercise book is. If you're covering a notebook with a spine you'll need to draw around three sides of one half of the notebook, carefully move the notebook to lay the spine down flat and draw along the top and bottom of the spine and then lay the other half of the notebook down and draw around the remaining three sides. This is to make sure you cut out enough to go round the spine. 3. You then need to add some flaps to each edge to secure the cover to the book. 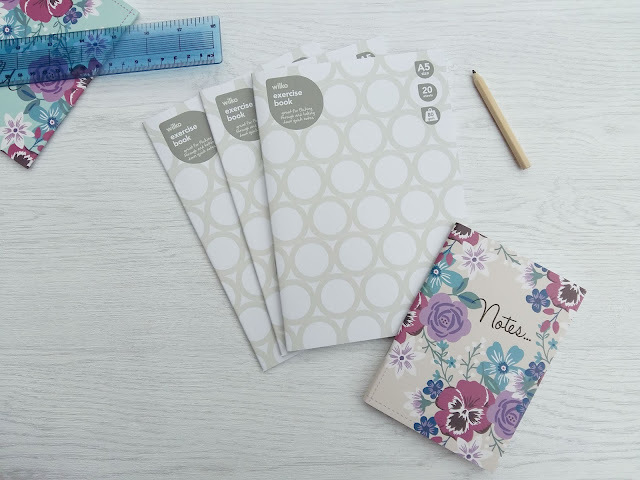 On the two outsides edges you'll just need one flap but on the top and bottom you'll need to draw two separate flaps that join where the exercise book folds. You'll want to try and keep these as neat as possible as although you can't see them from the outside you'll see them when you open the cover of the book. On the first book I made these by measuring in a cm and then out a cm to make the point of the flap but this was a little small so for the second one I went in half a cm and out one and a half cm's. 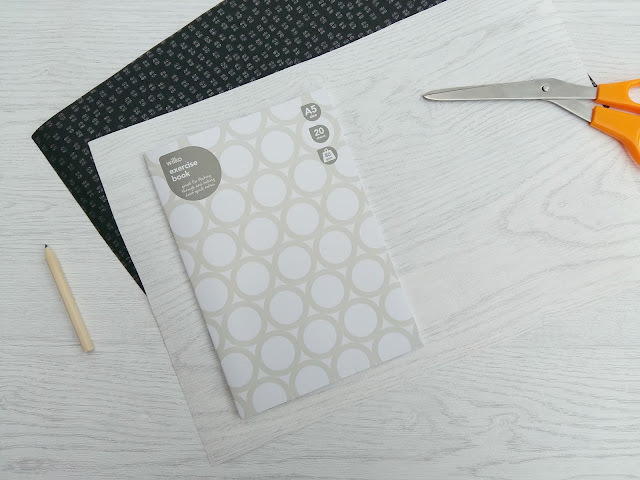 If you're covering a notebook you'll need to make three folds on the top and bottom line; two larger ones that end as they meet the spine and a much smaller flap that you can curve over the top and the bottom of the spine to give it a neat appearance. 4. Once you've drawn all of the flaps on you'll need to cut this out. 5. Open your book and place it flat within your traced outline. Starting with the front of the book, fold each of the flaps around the cover and secure inside the cover. Glue is obviously the neatest way to do this but I discovered that my glue wouldn't stick so I used Sellotape instead. Sellotape doesn't look as neat but works well. Once one side is stuck down rather than leaving the whole book flat it's best to prop that side up (either ask somebody to hold it or I used my stomach to hold it up) to make sure you're leaving enough space to curve round the fold of the exercise book. Otherwise once finished the covering could be too tight and might pull up the top of the book rather than it laying flat. If covering a notebook obviously do the same to go round the spine. You then secure the last flaps in place and you're done. 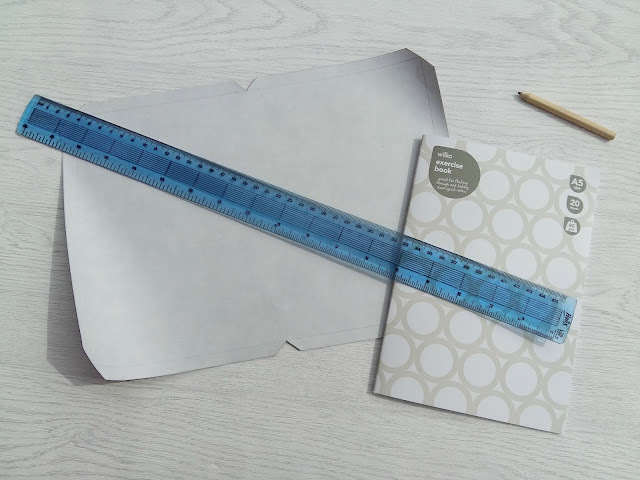 Covering my exercise books at school in sticky back plastic meant this stuck to the book all the way round, but covering them with wallpaper or anything else that isn't sticky will result in a slight 'puffy' appearance to the book once finished. If you'd prefer it to appear flatter you can use some glue just before you secure the flaps to stick the covering down to the book cover. 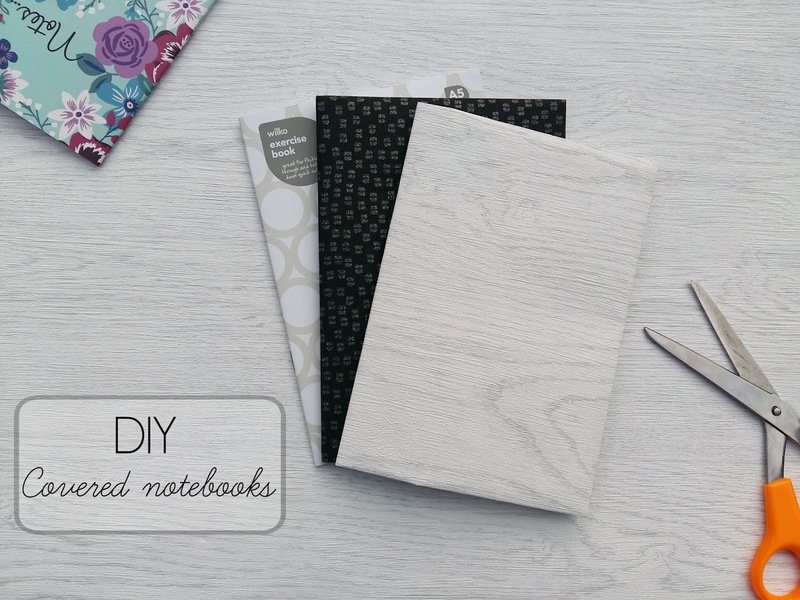 Will you be trying out making your own pretty notebooks?